International airlines invested $300 million in Virgin last year, prompting complaints from Qantas about an uneven playing field. 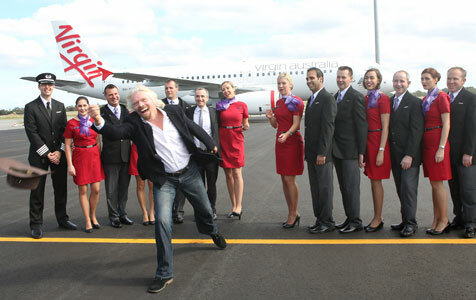 Qantas is the latest in a growing number of business icons to be confronted by rapidly changing market conditions. I think the grocery (fresh produce) business is very different from the car and the airline industries (or even from Target / K-Mart type industries). Grocery / fresh produce has on average shorter shelf-life for an important proportion of its products (as well as many varieties), and therefore, geographic proximity to the customers (in terms of shops or even warehouse deliveries) make them viable in Australia. Also, the grocery retail business benefits from clear economies of scope and scale (e.g., EBIT margin of Woolworths will be higher than EBIT margin of Coles, almost proportional to the market shares (or revenue shares)). Other retail industries (like K-Mart or even Harvey Norman) - with longer shelf-lives - are different from the grocery business (short shelf-life)... The car manufacturing industry on the other hand, although in theory could benefit from economies of scales effect, do not need to be constrained geographically. Moreover, the volumes are too low (20 plus million souls in Australia) to generate economies of scale. Also, they are "standard products" (not made to order / tailor made to customers), so they can be manufactured somewhere else. There is no chance competitive car manufacturing industries (competitive in terms of cost and quality) can compete in Australia vs global manufacturing behemoths in the medium to long run. Transport cost plays an important role. ... when the value of the goods are high (e.g., a car) versus the transport cost, ceteris paribus it may make sense to transport the car from somewhere else. Lastly, the airline industry: this is very interesting. I asked myself the question: Do we / Why do we need a "national airline"? or put it differently, is "national airline" for every country the natural norm of evolution in the long-run (if governments don't intervene?). I am not sure the answer is Yes for both questions..... I know it doesn't "feel right" in economic terms, but I am not surprised if one day Virgin, Air Asia / Singapore Air, or one of these airlines will service domestic routes in Australia, barring government protection-ism. Customers might welcome it, too.